Book Early for the Holidays. See the Contact Page for the Holiday Schedule. Even if your cat has never stayed in a cat hotel around other cats we recommend they try Group Cat Boarding. We have two spacious Group Rooms. Each receive most of their light naturally from skylights. There are lots of places to climb, run or lie quietly in the sun. Drop by for a tour any time you like or look around on our controllable web cameras. We are converting to infra-red cameras so you can see our feline guests day or night. There is something retro in this new technology. It displays only in black and white so you won't see the colorful environment surrounding our guests using the new webcams. We thought you would prefer to share cats' night vision. Our Group Play rate is $43 per day for one cat. Discounts are available for multiple cats and/or stays of 28 days, pre-booked and pre-paid at time of drop off. Cats are required to be current on their FVRCP vaccine and have a negative result of a FIV/FeLV blood test within 12 months. WE PREFER that ALL CATS boarding in GROUP PLAYROOMS receive the FeLV vaccine, but because of the sarcoma risk we do not require it. We leave that choice to be decided between owners and their veterinarians. Click HERE to download our test/vaccine requirements sheet. * We require prepayment at the time of drop off. 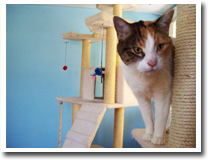 Our sunniest and liveliest room houses our most outgoing and active cats. They can catch the afternoon breeze in the enclosed outdoor cat veranda or nap in one of the cat tree cubbies. A fun mix of indoor only and indoor/outdoor cats board in our largest of the three group rooms. It has lots of natural sunlight, three giant 6 foot tall cat trees, catwalks all around the room and complete free range. It also has 2 fully enclosed cat verandas for a safe outdoor experience. The Blue Room is our mellowest room reserved for shy cats who like their space. This room is a great introduction to Group Boarding because these cats tend to like lots of personal space and do their own thing. 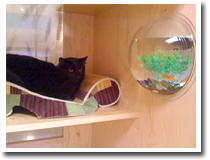 For cats who can't interact with other cats we have Private Condos and VIP Suites available. Although two cats can stay in one Condo, we can link Condos together, depending upon the space available, to give your cat, or cats, more space. 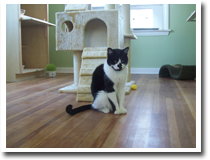 Our Private Condo Play Area is exclusive for each Condo, or group of linked Condos, in turn throughout the day for cats that have a negative result of a FIV/FeLV blood test within 12 months like for the group playrooms. Each negative tested cat spends part of their day inside the Private Condo and part opened onto the exclusive play area with another convenient perch or two and space to run and romp. Cats in Private Condos and VIP Suites never come into contact with cats outside their family. Our VIP Suites are walk-in Cabanas where your cat, or cats, can stretch out with no other cats around. This is the ultimate in Cage Free Cat Boarding. These VIP Suites are quiet and tranquil and perfect for special needs kitties. The very best in luxury cat boarding is now available to owners who don't want their cats to mix with other cats. A current FVRCP vaccine is required for all of our feline guests including all those in our Private accommodations. Click HERE to download our test/vaccine requirements sheet. Our Private Condo rate is $47 per night for one cat. Private Condo dicounts are available for multiple cats. and Cabana Skylight. The stepped rates are $70, $80, & $100 per night for one cat and $30 for each additional cat. pre-paid at time of drop off. The Private accommodation rates increase during peak periods, described on our contact page. Please feel free to call us, (323) 954-2287 or email us, LA@TheBestLittleCatHouse.com, for personal service. Choose from a variety of fun and luxurious activities designed to pamper and stimulate your cat. You can order these A la Carte or as daily activity packages. Each activity is $9. Punch cards are available at the discounted rate of 5 activities for $8 each ($40) and 10 activities for $6 each ($60). Tuna Tuck-In - Mix 1 cat, a generous helping of tuna then massage thoroughly. A Nip In The Air -Treat your cat to a fun playtime session with catnip infused bubbles. Laser Tag - We're convinced that laser pointers were invented by a cat lover specifically for a cat's enjoyment. Play Time - Feathers on a string or your cat’s favorite toy from home. It’s also a great way to exercise your cat. Song or Story Lap Time - Some quiet lap time with a story-book or a song. Brushing - Fun and playful brushing session. Cats love it and it reduces dead hair and dander. Each day one meal of canned and unlimited dry house feline fare is included in the boarding rate. The Best Little Cat House and its fifteen years of experience with Brands of cat food now provides the most widely palatable canned and most digestively agreeable dry cat food. It may not be the costliest, and that is not the point in choicing our house offered Brands. The canned food we offer successfully tempts all cats, all but the rarest highly discriminating feline palate. The dry food we offer is made from fresh chicken and rice, has supplements and probiotics and is preserved naturally using vitamin E. This dry food choice has brought an end to upchucked puddles and patties. $1 per meal if you wish to provide your own canned and/or dry food. $2 per additional meal of canned Best Little Cat House provided feline fare. Click HERE to download a PDF of our Boarding Health Requirements.